Gold's Gym has been providing fitness results since our original location opened in 1965 in Venice, California. The premier gym for serious fitness and Southern California's fitness enthusiasts, our Venice gym quickly became known as "The Mecca of Bodybuilding" and received international acclaim in 1977 when it was featured in the movie Pumping Iron. In just four amazing decades, Gold's Gym has become the largest co-ed gym chain in the world, boasting more than 600 facilities in 42 states and 27 countries. It is the gym of preference for amateur and pro athletes, fitness and beauty conscience entertainment industry professionals, and every day people committed to their health and the quality of their lives. With now more than 3 million members worldwide, Gold's Gym's unmatched experience and expertise continues to change lives by helping people from all walks of life achieve their fitness potential. Training and Education: Gold’s Gym is a multi-level comprehensive training and support system that provides management training programs to franchisees - Gold’s Gym University (GGU), Fitness and Nutrition Institute, and Gold’s Gym Management Institute. 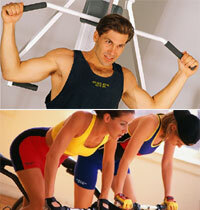 You will receive training materials and programs for use at your gym. Manuals, handbooks, planners will also be distributed to provide you assistance in managing your gym. Advertising: Advertising is a critical component in promoting any business, and an area that Gold’s Gym has excelled at for over 40 years. Our track record of effective, award-winning advertising campaigns has established Gold’s Gym as the most recognized name in the fitness industry worldwide. Our marketing materials consistently reach a wide target audience with an engaging, recognizable and memorable approach. We’re proud of our advertising and encourage all franchise owners to take advantage of this important aspect in gaining a competitive edge and building a profitable business. Architectural Design Guidelines: The Gold’s Gym Design Guidelines provide information to owners and their design professionals for use in achieving the Gold’s Gym design philosophy. The goal of Gold’s Gym is to establish an atmosphere that promotes personal health and fitness, embodies the dynamic energy that the Gold’s Gym brand represents, and enhances the community in which Gold’s Gym operates. Marketing Binder: All new franchisees receive a Marketing & Advertising manual containing everything from marketing contacts and logo guidelines to website and e-mail instructions. Marketing Planner: This tool outlines an entire year’s marketing mix featuring national advertising and public relations, national and local member promotions, employee recognition promotions and retail opportunities. .
Website: All franchisees receive an individual gym website as part of the Gold’s Gym website with your own URL. You have the ability to personalize content pages through navigation, upload images, and display live class schedules. Displaying promotional offers allow you to take full advantage of your gym’s 24-7 silent salesperson. You also have access to your own sales leads database, marketing materials, and franchise support tools with the Gold’s Gym Library -a virtual warehouse of information. National Vendor Program: Gold’s Gym franchising network offers economy of scale and power in numbers. We pool the purchasing power of our growing base of franchisees and align it with strategic suppliers through the Gold’s Gym National Vendor Program (NVP). We provide you unprecedented quality product selection and pricing. . Licensed Apparel Sales from Pro Shop: Why have a Pro Shop with Gold’s Gym Apparel? Every member needs something to workout in. As you look around your gym it is an awesome sight to see members working out in Gold’s Gear. Members wearing Gold’s Gear is a FREE advertisement. Through the Gold’s Gym Product Licensing program, franchisees offer a host of Gold’s Gym branded retail merchandise, nutritional supplements, and depending on location, food and beverage bars. To learn more about the Gold’s Gym franchise opportunity, simply complete the form below.